screen shot of the Las Vegas episode of The Ethical Hedonist. Presenter Bob Kelly came to Las Vegas to not only check out the casinos but to see what type of art is being made here. He visited Jo and I in our studios and then we took him around the local 'Arts Factory'. The photo below was part of the filming at Blackbird Studios. My touring exhibition 'Thirty-Three' has just started at the Hastings City Art Gallery. (From PAULNACHE): Matthew Couper is currently based in Las Vegas, Nevada, USA. His touring exhibition 'Thirty~Three' opens 4 February 2012 at the @Hastings City Art Gallery (HCAG) Hawkes Bay, New†Zealand. The exhibition comprises of 33 retablo paintings, documenting each year of his life†up until 2009 accompanied by a†large painting installation along with the short†film (currently screening) which focuses on his practice. A full colour, limited edition publication (with essay†'The Divine Self and the Church of Auto-Resurrection' by Dr. Peter J. Howland) is scheduled to be released towards the middle of March. 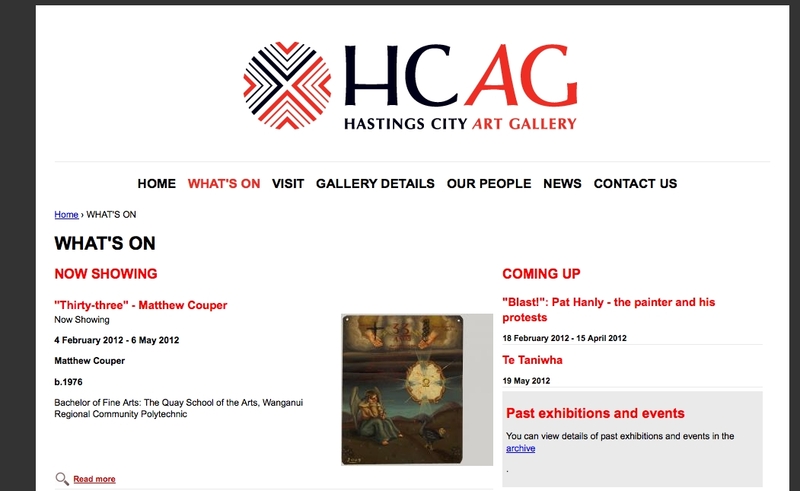 HCAG is one of six†venues exhibiting the show over the next 12 months. ’Thirty~Three’ was exhibited at PAULNACHE, Gisborne†in 2009. The gallery has represented Matt’s work since 2004.